Ongoing trials and tribulations of applying realist methods in primary research and research synthesis – aiming to promote understanding of the method and give insight into methodological developments. Or rather, I know what you didn’t do. (And thinking about what didn’t happen can be a useful feature of realist research, but more on that later!). I know that you didn’t attend a realist methods summer school in Liverpool… because there wasn’t one. Thankfully, however, there was this year and there will be next year. So, for those budding realists that missed out, I’m going to share my thoughts on what it was about the summer school that worked (for whom, etc…), and hopefully convince you of the value of attending next year. In true realist fashion, I’ll start with a C for Context. 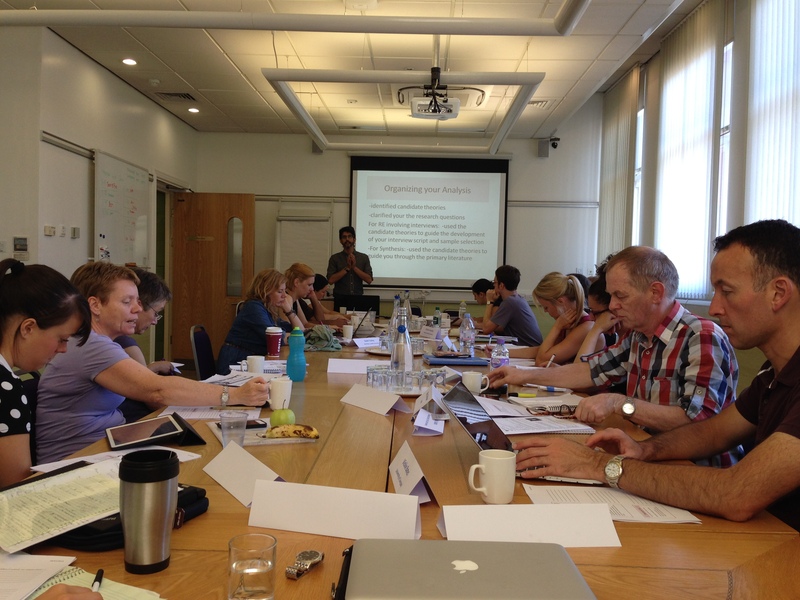 The summer school took place in Liverpool, at another C – the recently formed Centre for Advancement of Realist Evaluation and Syntheses (CARES) at the University of Liverpool. The venue was well suited to this sort of event, with a main meeting room (see photo) and several smaller ‘breakout’ rooms, as well as a central courtyard area for lunch and tea breaks. It’s hard to think of a more appropriate acronym for a research centre headed by Dr Justin Jagosh a leading figure in the application of realist methodologies to health services research. Justin really does care – not just about the development of realist research generally, but also about the individual projects that were shared, warts and all, by the participants of the summer school. His unwavering encouragement (not to mention his patience!) was valued by everyone and can definitely be considered a crucial enabling factor for a successful summer school. The participants were another key Contextual feature of the success of the summer school. 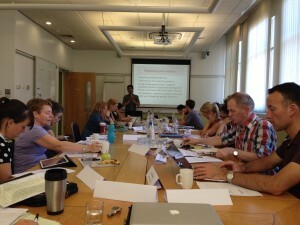 There were about 20 researchers from across the UK and one each from Australia and Holland. Most were PhD students, but there were also several teams of researchers, some with many years of research experience. Most were working in health services research, though the field of international development was also represented, and there was a good mix of realist evaluation and synthesis projects. What about the M for Mechanism? As Prof Rumona Dickson, the Director of the Liverpool Reviews and Implementation Group (which CARES sits within), put it, “the idea is a simple one – if you bring a bunch of people together working on similar projects, with protected time and space to work, then good things will happen”. So, the “program theory” or mechanism is something about having protected time in a supportive environment, i.e. without phones ringing and emails pinging. Sounds good to me. If you take the Pawson approach to mechanisms as being “resources and the response(s) to them”, the protected time could be considered one “resource”, but there are several possible others – the sharing of experiences by colleagues, and nuggets of wisdom from Justin, for example. And there were plenty of nuggets. On the first day, we had an overview of the logic and key ingredients of the realist approach, and were introduced to the concept of “retroduction” (an approach to scientific inquiry described as the “spark of creativity” associated with the realist researcher!). On day 2, we worked through examples of realist reviews to explore CMO configurations in more detail. The questions, “what is actually going on here?” and “why did this intervention not work, for these people, in this context?” were posed, as another way of thinking through potential mechanisms. Days 3 and 4 provided more protected time and space to work on our projects, either individually or in groups, in rooms designated as either ‘quiet’ or ‘chatty’ (I prefer ‘collaborative’). We were also presented with the idea, frequently reinforced by Justin, that it’s perfectly normal and acceptable to move from confusion to clarity (and back again! ), throughout the process of realist research. Realist research is an evolving methodology with no prescribed set of rules to follow. For me, the maxim “one size doesn’t fit all” applies as much to the process of realist research itself as it does to the majority of complex interventions that the methodology has been used to evaluate. This flexibility (and inherent uncertainty) can be at once both comforting and disconcerting, and takes some time to get used to (a variable “response” to these nuggets of “resource”, perhaps?). Ultimately, the Cs and Ms that are included in any realist research project will be shaped by the O of Outcome(s). Indeed, many realist researchers recommend starting with your Outcomes and working backwards, when hypothesizing potential Mechanisms and their enabling or constraining Contexts. The desired Outcome for most of the summer school participants was simply to make progress with their realist projects. The general consensus was that this had definitely been achieved: for some, there were “breakthrough” moments; while for others, they simply left a little more confident that they were working along the right lines, and a little more comfortable with the uncertainties of the process. For me, as the proud (if a little exhausted) father to a six week-old daughter, three nights of undisturbed sleep was perhaps my greatest Outcome! I’d like to finish by thanking my PhD supervisors for encouraging me to attend the summer school, my funder (the Scottish Government’s Chief Scientist Office) for enabling me to attend, and my wonderful wife Miriam for allowing me to attend. I look forward to meeting up again with many of the summer school participants, along with other realist researchers, at the 1st International Conference on Realist Approaches to Evaluation and Synthesis, to be held at the same venue in Liverpool between 27th and 30th October 2014. In the meantime, happy retroducing!